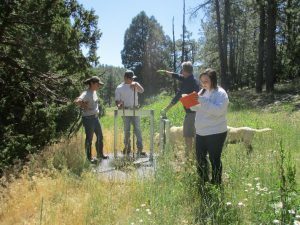 The YCC Crew started two years ago, during those two years they have inventoried and mapped 31 acequias in the East Rio Arriba Soil and Water Conservation District. Names of YCC Crew: Caitlin Ortega, Deandre Velasquez, Michael Purdy, and Chavela Trujillo. This project engaged local youth in conservation by applying technology to the importance of soil and water conservation in our communities of Eastern Rio Arriba. Acequias are vital to the sustainability of agricultural producers in our area and it is with the help of technology and engaging youth we can create improvements and infrastructure to areas that are in need. The youth involved in this project used GPS devices to map out Acequias within our conservation district. They learned basic GPS along with conservation resource inventory skills. The youth partnered up and documented areas of concern, irrigation turnouts, and took photos along the Acequia. The waypoints taken from each Acequia will be turned into shape files and will be given attributes. After all the data collection takes place, the youth will create maps and reports for each Acequia they work on. The shape files will be entered into a data base to collaborate with Acequia groups for future conservation planning. Commissioners, do your Acequia bylaws need to be updated?